The shelves inside Christian book stores are filled with Bible Story books. These books can sometimes be found inside mega-chain book stores, discount book stores, yard sales, swap-meets, pawn shops, libraries and the list goes on. You’ve seen one, you’ve seen them all, right? What could be so special about this one? 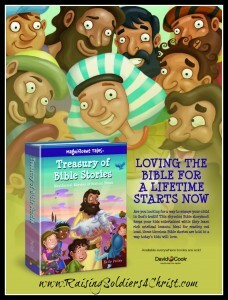 Magnificent Tales are rhyming Bible stories with clever art and clear lessons that the whole family will enjoy. The stories and illustrations are so engaging that you won’t grow tired of reading and rereading a Magnificent Tale night after night! From “The Salty Tale of Noah and the Ark” to “The Lasting Story of the Last Supper,” the rhyming tales in this book remind us that God loves his people—in the Bible and today! I have a lot of Children’s Bible story books. When I was asked to review this Bible Story book, I thought to myself, “What is so special about this particular one that makes it different than the rest I already own?” When I received the book, I was immediately drawn to the cover illustration. Stating that it is beautiful just doesn’t seem to give it justice. However, my excitement pales in comparison with that of my 5 year old. He LOVES to read stories about Jesus. As we paged through the book, we were both mesmerized by the beautifully detailed pictures throughout this book. I’m sure we’ve all seen pictures of Jesus sitting on a large stone speaking to children, or something similar to this. Many of us relate this depiction as Jesus loves the little children. The pictures found in “Magnificent Tales” consumed my 5 year old and he was able to easily relate to the stories. All three of my boys were captivated by the pictures. In fact, my middle son said, “Mommy the pictures are really nice!” Although he is 10 and doesn’t need a Children’s Bible Story book to comprehend the Bible Stories, he loves reading aloud with us! The age range suggested for this book is 4-8. The stories are written especially for young readers; however, as previously mentioned, my 10 year old also enjoyed it. The fascinating stories are presented in the same order they are found in the Bible. The fact that the stories rhyme makes them that much more interesting for children. Also, what easier way to memorize than by rhyming? The ONLY thing I could pick on if I was going to pick on anything is it didn’t cover the book of Revelation. Then again, the majority of Children’s Bible Story books do not either. However, this doesn’t affect me using the book nor or how great the book is for my family. I think my boys, especially my youngest, will enjoy this book for years to come. All my boys are already reading well, but this is a good book to work on reading speed with them! I give this a 5/5! Also, here is your chance to enter to win a copy yourself!! !